VTconsole is a telnet and ssh client specialized for application in industry and retail. The target group are users of legacy host applications like i.e. SAPconsole which are text based and run under Windows Server, VMS or Unix. VTconsole supports the high speed scan engines of Linea Pro and Infinea Accessories of the US based company Infinite Peripherals. 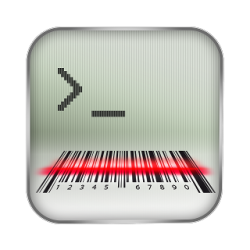 It is also possible to use the builtin iPhone camera as a barcode reader. VTconsole runs on iPhone 4s or newer or iPod touch 5G or newer. It requires iOS 9 or newer. The app supports usage of product line LineaPro and Infinea by Infinite Peripherals. VTconsoleConfigurator is a utility program that is related to macOS app VTconsoleAssistant and helps managing iOS App VTconsole. With VTconsoleConfiguarator you can edit all preferences of VTconsole on your Mac. This includes creating and changing of host profiles, of keyboard layout and size, font and its size, barcode prefix and suffix etc. Using VTconsoleAssistant you load a configuration from an iOS device, which runs VTconsole. Subsequently, VTconsoleConfigurator can continue to edit the configuration. Finally VTconsoleAssistant can distribute the modified configuration file to numerous iOS devices.